With a population of nearly 13,000, Kewanee is fortunate to have small-town appeal, and local media outlets are one of the main reasons for this. Keeping residents informed about their community, schools and neighbors leads to a feeling of pride and unity and that is readily apparent in Kewanee. Kewanee has access to the Star Courier, the only five-day-a-week newspaper in Henry, Stark and Bureau counties. GateHouse Media is the parent company. Tracing its origin to 1898, the publication features local news, sports and local advertising information for readers. The Star Courier�s newspaper is delivered Tuesday through Saturday mornings to subscribers in the three counties. 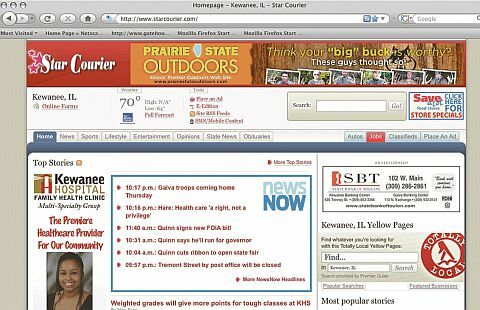 A Web site provides Kewanee news to people all over the world, and readers may also subscribe to the Star Courier�s EEdition, which offers the entire newspaper online in PDF format. The area is also served by AM and FM band radio. WKEI-1450AM has been on the air in Kewanee since 1953 and still offers local news and other talk-radio programming. Its owner, Virden Broadcasting, also owns two FM stations, WYEC-93.9FM easy listening and WJRE-102.5 Hog Country. Comcast provides cable television in Kewanee. Residents of Kewanee also have access to the Internet via several local providers offering many services including high speed wireless, DSL and cable modem service.